We cannot discard the old system within a day, but we can make big steps by introducing a new scale for evaluating “quality of life” and for encouraging an economy where the harmony and beauty of life are truly respected and appreciated. In this context, safeguarding the environment needs to become a concrete asset of every national economy. Financial success needs to be evaluated on the basis of improving living conditions on the entire planet, and contributing to the most pressing task of reversing destructive trends. Cultural wealth, the preservation of natural resources as a measurable part of a nation’s prosperity, better health, and education are a “genuine” profit for society. Today, we have the wisdom to control economic progress and we should apply it to its full extent. We can use the knowledge gained to successfully exit the current crisis and improve the world for the generations to come. The beauty and wealth of natural, cultural and historical diversity can build a positive framework for the future. Once our economies become based on long-term, life-supporting financial policies, they will be more efficient in sustaining growth in the future.6 Once world leaders acknowledge the urgency of protecting the environment, they will be more successful in fulfilling the needs of the community, the country and the world. Three-dimensional economics – first proposed by B.I.O. in 1995 – emphasises the relevance of the environment on all economic actions. For the world economy to recover, it must become linked to long-term global environmental policy. The mitigation of environmental degradation is an overwhelming global mission, but it has also created new opportunities for employment and economic growth by spurring the need for innovation and skills. Environmental improvement jobs have benefitted many economies by providing the work force and their families with money to spend, which is then recycled through the economy. The environmental projects established may require equipment and materials, which must be purchased so that opportunities are created for new markets to develop. The eventual improvement of the environment is itself an economic benefit, allowing for productive use of the restored environment for resource management, wildlife habitat, parkland or tourism. Too often, people view the protection of the environment as someone else’s job. They consider that industry or the government should have the responsibility for cleaning up pollution. If we are to succeed in reversing global environmental degradation, people everywhere must be imbued with a love and respect for the environment. To advance this vision, B.I.O. launched the International University for the Bio-Environment (I.U.B.E.) in 1990. This educational initiative urges scholars, decision-makers, diplomats, business leaders, teachers and students to actively contribute to the development of an environmentally conscious society. Bearing in mind that universities should be, by definition, “universal,” the I.U.B.E. promotes a model bio-education and acts as a catalyst to accelerate environmental awareness and impart a biocentric message to students and training professionals around the world.8 Leading educators and decision-makers infuse existing educational institutions with bios promoting values. The essence of bio-education is the incorporation of environmental thinking in all academic disciplines and all educational levels. Environmental issues can be applied to fields as diverse as theology, philosophy, diplomacy, economics, law and architecture, helping to assess future progress. I.U.B.E.’s e-learning programme, a series of online environmental courses, is an essential vehicle for making bio-education available to as many individuals as possible that has so far elicited the participation of representatives from 119 countries. The goal of these courses is to address the urgent need to improve quality of life and to mobilise each individual to participate in protecting our common environment and its rich biodiversity. By using technological advances in this positive way, a uniquely rich source of information and training material can be placed at the fingertips of teachers, students and professionals around the world. A “bio-assessment of technology,” ensuring technological and economic progress that support the environment would bridge the gap between technology and societal values.3, 4 In a dialectic exchange of views, presenting a thesis and antithesis and then creating a synthesis of new concepts, ways of reducing negative environmental impact could be identified so as to truly benefit from the contributions of technological breakthroughs. Emphasis should be placed on the eradication of factors causing the decline of values in society, to harness environmental deterioration, species extinction, water and atmospheric pollution, climate change, soil erosion, acid rain and nuclear waste. This is a crucial responsibility for humanity if we are to develop technologies that respect and protect bios. Clean energy is free and inexhaustible. More in-depth research will help us to overcome the hurdles that exist in order for renewable energy to be used on a larger scale. The potential of solar energy is enormous and should be deployed as the primary source of energy by most countries, especially those with abundant sunlight. Wind farms are more and more common, and many economies are benefiting from this system of generating electricity that is both very reliable and almost pollution-free. The broad range of current and prototype fuel cell and hydrogen developments taking place in the field of transportation has led to better functioning electric automobiles with no noise pollution and no exhaust gases. Soon, current modes of transportation will be replaced by electric vehicles. These developments will lead to a greater and wider use of hydrogen cells, which is quickly becoming the wave of the future. In this effort, inspiration can be drawn from biological models. Algae are tiny biological factories that use photosynthesis to transform carbon dioxide and sunlight into energy. Algae can grow in salt water, freshwater or even contaminated water, at sea or in ponds, and on land not suitable for food production. Moreover, algae should grow even better when fed extra CO2, the main greenhouse gas, and organic material like sewage. A microbial fuel cell (MFC) converts the chemical energy found in a substrate directly into electricity. To achieve this, bacteria are used as a catalyst to convert substrate into electrons. The bacteria are very small (size approximately 1 µm) organisms which can convert a huge variety of organic compounds into CO2, water and energy. The micro-organisms use the produced energy to grow and to maintain their metabolism. However, by using an MFC, it is possible to harvest a part of this microbial energy in the form of electricity. Hydrogen has unique potential for reducing today’s dependency on fossil fuels. Hydrogen can be produced from renewable resources, such as water and agricultural products, eliminating the net production of CO2 and helping to alleviate global warming. The transition to a hydrogen based economy begins with the commercial production of hydrogen-based fuel cells, where it is efficient and intrinsically clean, for all end-use applications. Additional research is needed in this area to reduce the cost of hydrogen production, solve hydrogen storage problems and in the longer term, integrate renewable energy sources into hydrogen fuel production. Bio-diplomacy – a concept pioneered by B.I.O. at a time when the world community had not fully realised the urgency of adopting common environmental policy – focuses on the interdependence of all forms of life. It supports efforts to maintain biological and cultural diversity and seeks to improve human relations and to attain world peace by replacing current diplomatic attitudes with a complete international and intercultural perspective. Within this framework, respect for human rights and the existence of multi-ethnic and multi-cultural societies is an undeniable principle. International cooperation in environmental protection enhances quality of life and strengthens efforts for peace and security. National defence is a major priority among most nations of the world. A substantial portion of national budgets is committed to the maintenance of armed forces and the acquisition of weapons, such as highly sophisticated fighter aircraft, warships, submarines and missiles. Globally, about 10% of central government budgets are devoted to defence. The environment, as a common point of reference, can bring all peoples of the world together, in a state of harmony and the absence of war. The conversion of war regimes to programmes for the preservation of the environment would guarantee a better future. Such a programme would not have negative economic effects, but rather, it would stimulate the global economy and provide jobs, since existing defence industries would be re-tooled into “defence-for-life” industries. Existing defence manpower and equipment can be adapted for peaceful tasks such as reforestation, water resource clean up, soil erosion recovery, protection of the ozone layer and de-contamination of areas affected by nuclear radiation. These problems represent real threats to the continuation of life on our planet, and no human resource should be spared in the effort to contain them. To be effective in our response to environmental challenges it is essential to stop re-inventing the wheel. It has been one of the main objectives of B.I.O. for many years to raise awareness of the importance of the development of an internet based “Bank of Ideas” where any interested party may contribute information and expert advice across a broad range of sectors, in order to help coordinate environmental protection efforts and harness valuable resources.3,4,9 The creation of such an electronic resource would also facilitate an expedient transfer of know-how as to how to face environmental emergencies when immediate action is of the essence before it is too late. In the effort to create a more just and sustainable global economy, we need to forge a partnership of purpose that involves the whole world. With the tools made available by modern technologies, governments everywhere can better focus on the true needs of their citizens. Breakthroughs in the field of telecommunications provide the opportunity for the public to be actively involved in issues concerning our daily lives and to be able to cast a vote through the internet and other communication link-ups, which can make immediate feedback possible from any corner of the globe. It is the purpose of the B.I.O. World Referendum, first proposed in 1991, to transcend national boundaries and bring the world together in a common cause.12 In today’s complex society, nations seldom share priorities. Climate change and other environmental concerns are possibly the only issues that are relevant to all the nations of the world. Furthermore, environmental degradation and resource depletion are often the impact of extreme poverty on the planet. A simultaneous electronic ballot on saving bios is a brilliant opportunity to demonstrate that, as citizens of the world, we can all agree on safeguarding the Earth for the generations to come. Decisions on our common future should no longer rest solely on world leaders, who can evade or even obstruct meaningful change. Every individual, whether poor, underprivileged or not, can and should be involved. By giving priority to individual voices to be heard, the World Referendum can elicit the personal involvement of every citizen in the race to save the environment and help to bridge the gap between the rich and poor. With the first decade of the new millennium already behind us, we need to act quickly to replace the mistakes of the past with positive action for a future where world peace, health, education, and respect for bios will be a reality for every citizen. The timely support of dedicated thinkers and doers will help to implement the World Referendum and to arrest the escalating environmental and economic crises which are occurring at such a rapid pace. Both institutions and individuals are requested to participate in this global campaign. The flexible nature of the World Referendum allows for immediate changes in the attitude of people throughout the world by creating an awareness of existing threats and raising the respect and understanding of bios. Escalating economic and environmental instability worldwide is making it clear that we need governance with a vision. Ensuring our planet’s health and security is our fundamental responsibility to future generations. To rise to this global challenge, decision-makers need to avoid the mistakes of the past and find inspiration in life-supporting development models. The time to change is now. Politicians must place the environment as a priority, not because of public pressure, but because of personal commitment. A new structure of society and governance is needed to enable us to overcome the current crises.A “green society” of security and transparency, where biosis valued over greed and where peace and harmony replace discord and destruction, can help us understand and value the multiple links between the environment, the economy and the future development of society. Techne and technology must join forces to help achieve a better quality of life and to provide a vision of hope and joy for present and for future generations. By giving priority to individual voices to be heard through a World Referendum and by encouraging the participation of every individual and every profession in Environmental Olympics we can elicit the personal involvement of every citizen in the race to save the environment. The clock is ticking. Can we hear it and act now, or will we face the continued decline in our environment and quality of life? The pursuit of narrow self-interest at both the individual and national levels has resulted in a global crisis which threatens world peace, as well as the natural environment and human prosperity. We urgently need to change these trends by building a responsible and sound economy that can lead humanity to a brighter future. 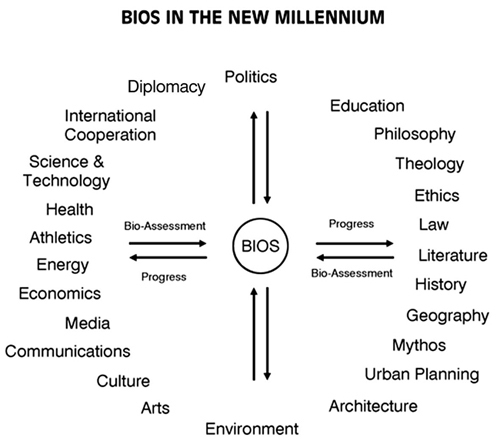 A bios-promoting vision that places the ethics of bios at the heart of societal structure can provide the necessary framework to achieve a world in which the gift of bios is truly appreciated. The need for action is now. Climate change is accelerating desertification, plant and animal species are disappearing from the earth at unprecedented rates. Human populations are being displaced and driven to poverty and disease, the credit crunch is affecting consumers’ environmental efforts across the globe. Humanity can no longer afford to disregard the close relationship between its actions and the environment. Meeting today’s challenges requires new ways of stimulating creativity in politics and policy-making, technology, industry and commerce, in education and the arts and social and community development. The widespread adoption of environmental thinking is the only way to alleviate economic instability and create a new green society of hope. 1. Vlavianos Arvanitis A. (2008) Green salaries: reversing unemployment through environmental protection. Biopolitics International Organisation, Athens, 144 pp. 3. Vlavianos Arvanitis A. (1985) Biopolitics. Dimensions of biology. Biopolitics International Organisation, Athens, 16 pp. 8. Vlavianos Arvanitis A. (ed.) (1990) Biopolitics – the bio-environment III. The International University for the Bio-Environment. Biopolitics International Organisation, Athens, 683 pp. 10. Vlavianos Arvanitis A. (ed.) (2003) Bio-Syllabus for European Environmental Education. Biopolitics International Organisation, Athens, 880 pp. 11. Vlavianos Arvanitis A. 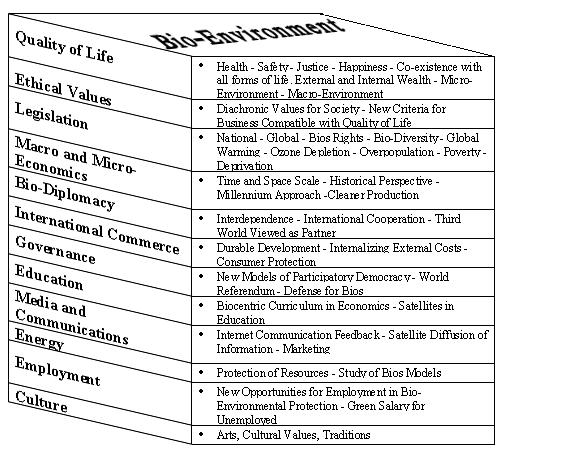 (1992) Biopolitics – the bio-environment – Bio-Syllabus. Biopolitics International Organisation, Athens, 151 pp.